As Protestants prepare to mark the 500th anniversary of the Reformation, new Pew Research Center surveys show that in both Western Europe and the United States, the theological differences that split Western Christianity in the 1500s have diminished to a degree that might have shocked Christians in past centuries. Across Europe and the U.S., the prevailing view is that Protestants and Catholics today are more similar religiously than they are different. And while the Reformation led to more than a century of devastating wars and persecution in Europe, both Protestants and Catholics across the continent now overwhelmingly express willingness to accept each other as neighbors and even as family members. 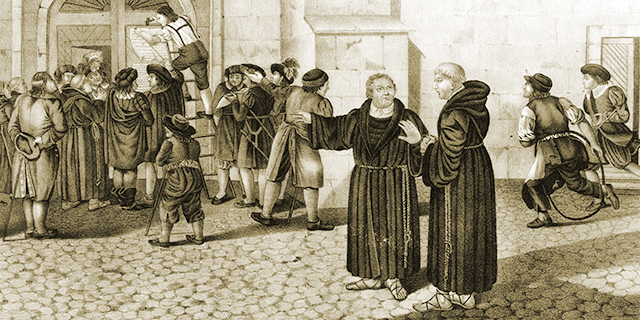 Although Martin Luther and other Protestant reformers in the 16th century held that eternal salvation is attained solely through faith (a belief known in Latin as sola fide), the surveys show that many Protestants today say instead that eternal salvation is attained through a combination of faith and good works – which is the traditional Catholic position. Indeed, in most of the Western European countries surveyed, Protestants who believe that salvation depends on both faith and works outnumber those who say salvation comes through faith alone. These are among the key findings of two separate Pew Research Center surveys – one in Western Europe and one in the United States – conducted in recent months. In Western Europe, the Center conducted telephone surveys from April 11 to Aug. 2, 2017, among 24,599 people across 15 countries. In the U.S., the survey was conducted online from May 30 to Aug. 9, 2017, among 5,198 panelists on Pew Research Center’s American Trends Panel (although all of the questions analyzed in the survey were asked of only half the sample). There are common threads between the two surveys – both included questions to gauge how Protestants and Catholics view each other, and both asked respondents about their views on salvation. However, the results of the two surveys are presented separately because they were conducted using different modes (the European surveys were administered by interviewers via telephone, and the U.S. survey was self-administered online) and because they included some different questions. About half of U.S. Protestants (52%) say both good deeds and faith in God are needed to get into heaven, a historically Catholic position. The other half (46%) say that faith alone is needed to attain salvation. U.S. Protestants also are split on another issue that played a key role in the Reformation: 46% say the Bible provides all the religious guidance Christians need, a traditionally Protestant belief known as sola scriptura. But 52% say Christians should look for guidance from church teachings and traditions as well as from the Bible, the position held by the Catholic Church. Just 30% of all U.S. Protestants affirm both sola fide and sola scriptura. However, belief in sola fide and sola scriptura is much more prevalent among white evangelical Protestants than among white mainline Protestants or black Protestants in the United States. Among self-identified white evangelicals, 44% express both convictions, and this figure rises to 59% among white evangelicals who say they attend church at least once a week. In a series of multiple-choice questions, most U.S. adults (65%) correctly identify the Reformation as the term commonly used to refer to the historical period in which Protestants broke away from the Catholic Church. And a similar share (67%) correctly identify Martin Luther as the person whose writings and actions inspired the Reformation. Far fewer (23%) know that only Protestants traditionally teach that salvation comes through faith alone; 45% erroneously say both Protestantism and Catholicism traditionally hold that position, while 19% say neither religious tradition espouses sola fide, and one-in-ten U.S. adults (11%) say only Catholicism traditionally teaches that salvation comes through faith alone. Views on sola fide are tied to levels of knowledge about it. Among U.S. Protestants, knowing that only Protestantism traditionally teaches that salvation comes through faith alone is closely linked with believing that salvation comes through faith alone. Among Protestants who know that only Protestantism traditionally teaches that salvation comes through faith alone, about three-quarters (77%) embrace the concept of sola fide. But among the much larger share of Protestants who are not aware that sola fide is solely a Protestant teaching, far fewer (35%) believe that faith is all that is needed to get into heaven. In nearly all of the European countries surveyed, majorities or pluralities of both Catholics and Protestants adhere to the traditionally Catholic view that both faith and good works are necessary to attain salvation. In fact, in every country except Norway (where 51% of Protestants say salvation comes through faith alone), belief in sola fide is a minority view even among Protestants. Catholics and Protestants in Western Europe generally report low levels of religious observance: Medians of just 8% of Protestants and 14% of Catholics say they attend religious services weekly or more. But Europeans who say religion is important in their lives are especially likely to hold their respective church’s traditional position regarding the means of salvation. For example, 31% of Protestants in Sweden who say religion is “very” or “somewhat” important in their lives believe in sola fide, compared with 10% of other Swedish Protestants. The impact of secularization is apparent, but so are pockets of religiosity. For instance, the Netherlands has a relatively high level of disaffiliation, with about half of Dutch adults (48%) describing themselves as atheist, agnostic or “nothing in particular” religiously. Yet Dutch Protestants also stand out for some of Europe’s highest reported levels of church attendance, with 43% saying they go to church at least once a week. 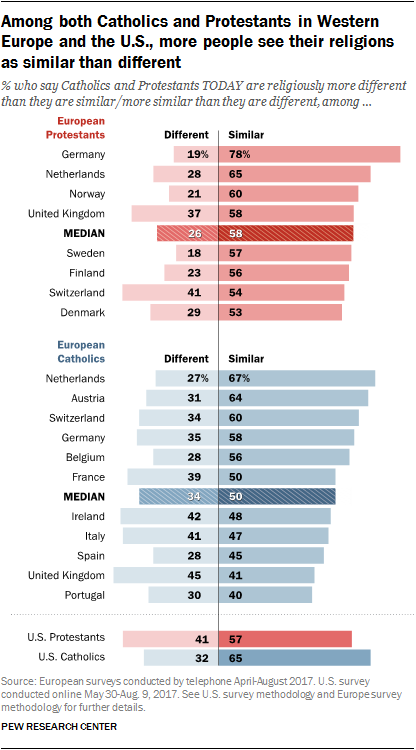 In every European country surveyed, roughly nine-in-ten or more Protestants and Catholics say they are willing to accept members of the other tradition as neighbors. And large majorities of both groups say they would be willing to accept members of the other group into their families. For example, 98% of German Protestants say they would accept Catholics as members of their family, and a similar share of German Catholics (97%) say the same about Protestants. Since this report was published, Pew Research Center improved the Western Europe survey weights for greater accuracy. Subsequent analyses based on data from 15 European countries use updated weights leading to slight differences in some numbers between this report and other publications. The substantive findings of this report are not affected by the revised weights. Please contact the Center for questions regarding weighting adjustments.